In 2012, all fish left Earth. In 2013, Japan really wanted to eat fish so they founded the Space Fisherman Program. The best fishermen in Japan are mandated to take astronaut training so that they may go into space using digital gods from a cell phone video game and capture delicious fish. But six middle school girls with funny accents want to become the first ever women space fishermen. They undergo harsh training day and night to train their bodies for the tough terrain of underwater space. They must also train their minds to withstand the harsh sexist rhetoric of a male dominated field. 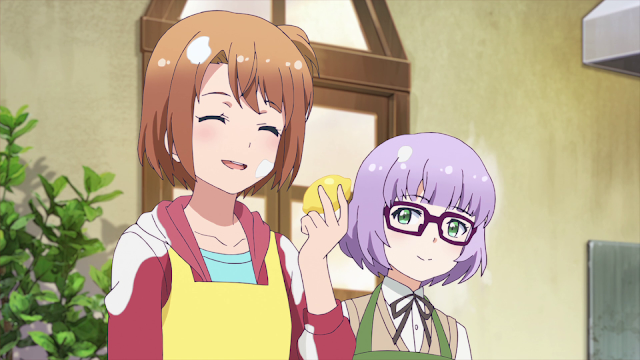 Here is a picture of them making lemon pancakes, an important training regime. Will these girls be able to pursue their dreams of space fish Between the Sky and Sea?